Get recognized in your community! 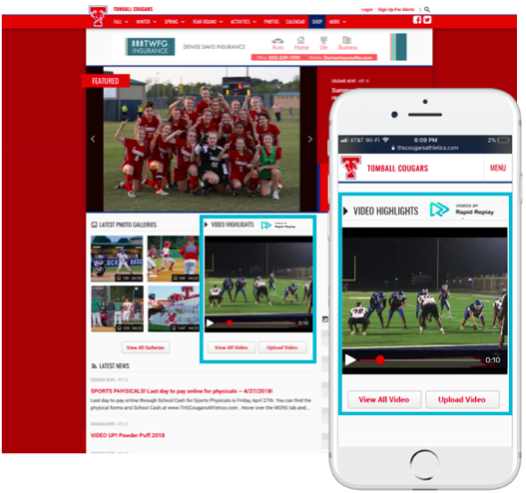 Use Rapid Replay’s free mobile app and embeddable video player for your team, club, school, or organization to bring engaging video content directly to the community. Film, share, and follow video highlights in your community with Rapid Replay’s free mobile app. Empower your community members with easy-to-use video capture tools. One-tap highlight capture and easy video tagging with our in-app camera. All videos relevant to your team or community are automatically indexed and shared to other community members on the app. Watch your organization’s video clips in action by embedding our video player. All videos filmed or uploaded to Rapid Replay will automatically play to be viewed by your community at large. Read more below! Rapid Replay’s free-to-embed video player brings engaging video directly to your users. Don’t have reporters in the field? Working with individual organizations, teams or clubs? Embed the Rapid Replay video player on your site or platform, and your audience can use Rapid Replay’s free mobile app and video upload tools to have their clips featured in front of your community. Community members are engaged on both sides - contributors get publicity for their automatically featured clips and viewers keep coming back to your site for engaging video content.